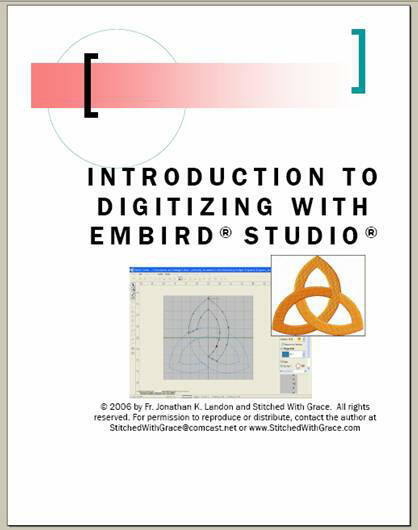 Father Jonathan's tutorial Introduction to Digitizing with Embird® Studio® walks you step-by-step through the process of creating a design with the Embird® Studio® application. You will import a graphic file into the Embird® Studio® workspace, and use it as a template to create a simple design. This 14-page tutorial costs only $10. * Click the "Add to Cart" button to purchase this tutorial through PayPal. * Residents of the state of Washington, add 8.8% sales tax.